You followed a track, were directed by a wooden signpost, climbed over rocks, crossed rivers and learnt new things. I dreamed someday I would know everything about these magical places and be able to walk along and name every creature, so when it came time for me to go to university, I studied the environment. However, I learned things which filled me more with unease and discontent than joy and wonder. I learned that nowhere in our world is truly pristine. Although I continued to visit national parks as often as I could, I began to feel as if I had peeked behind the curtain. On every walk, I could see the challenges park management faced: demand for more facilities taking focus from conservation activities, hordes of visitors eroding the paths and tracking in weeds, the intensity required to build good relationships with neighbours. 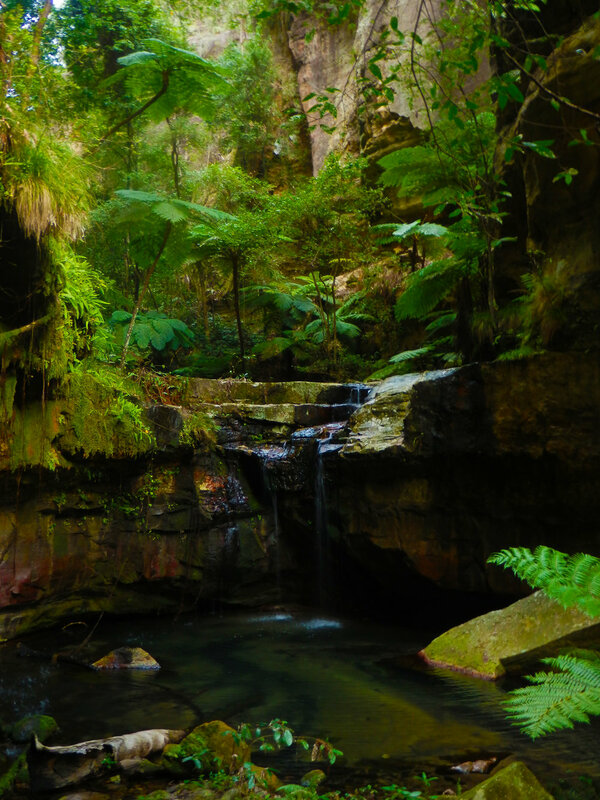 All this changed when I had the chance to spend three days in Carnarvon Gorge National Park. The ongoing spiritual significance of this place was immediately apparent to me even before I saw the ancient paintings and carvings or knew about its power as a place for the transmission of knowledge. I came to appreciate the obvious dedication to Carnarvon possessed by its previous caretakers, both Indigenous and rangers. The stairs to Boolimba Bluff lookout are a monument to this dedication because of the effort put into building them, all so that others could share in the wonder of the place. It is a remote park, not just because of its distance to the nearest town, but the inaccessibility created by the ruggedly beautiful cliffs. Further experiences buoyed my waxing sense of wonder, including a chance encounter with a zoologist who showed us the frogs hidden in the stones, the discovery of a feathertail glider near our tents when spotlighting, and finding myself on a rock by a creek at dusk with a cup of chamomile tea waiting hopefully for a glimpse of a platypus. The most enduring experience, however, was the presentations, conversations and my own reflections. Conversations about things like the complex structure of vegetation communities not usually found outside of national parks and knowing how three kinds of granite and soil microbes filter rainwater giving a high-quality supply to the surrounding farmers. The atmosphere of Carnarvon was so intoxicating and its inhabitants so fascinating that for a while it seemed there was no topics anyone would rather speak or think on. National parks are restorative places, they reconnect us and provide a space that cannot exist in a manufactured world. There is a communal feeling there which could not be regained once we had left. I left more committed than ever to these places of wonder, adventure, solitude and quiet reflection. It is fitting that these repositories of history, heritage, and natural processes remain places to learn and share knowledge.